Most models from the Grand Sturdy series are available as AC (with aft cabin) or Sedan (with open cockpit). Both versions will appeal to you with their charm and unique features. Sedan models have luxurious solid teak double doors, which can be opened and secured at 180°. This means that while you are at the helm, you still have optimal contact with the other voyagers in the saloon or the cockpit. 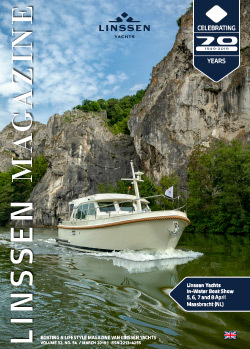 The Sedan models can also be supplied with the Linssen Variodeck. This large aluminium sliding roof means that while you are at the wheel inside, you still have a feeling of the great outdoors. In contrast, the AC models have a huge aft cabin with a double bed and toilet/shower*. There is a spacious aft deck with a folding roof as a standard feature. This offers protection while you are at the helm outside. The aft deck offers excellent views of the passing landscape. Each Grand Sturdy 40 ft and above is an imposing presence with many hidden gems. From the 40.0 onwards, these yachts provide living space for as many as eight people. The extra side cabin, with two single beds, is remarkably spacious and has a lot of cupboard and drawer space. The efficient layout of these yachts gives an unparalleled impression of space.